by E.U. member states: concrete, wire, and electronic surveillance. The film follows the Mediterranean coast inward to metropolitan seats of power, offering political insight through the juxtaposition of modern imperial authority and desperate migrant poverty. In the shadow of its own narratives of freedom, Europe has been building its own great wall. Like its Chinese precursor, this wall has been piecemeal in construction, diverse in form and dubious in utility. The Great Wall moves across fortified landscapes, pausing with those whose lives are framed by borders. Moving inward toward the seat of power, the film holds the European project up to a dazzling cinematic light, refracted through Kafka’s mysterious text; ultimately questioning the nature of power. Tadhg O’Sullivan is a film-maker and sound artist living in Carlow, Ireland. Working within the documentary and experimental film traditions his work often explores the relationships between individuals and societal structures of power. 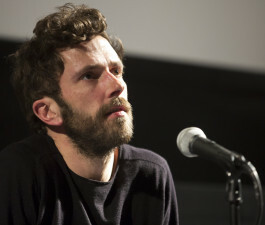 His first feature film Yximalloo (co-directed with Feargal Ward) has shown at numerous international film festivals, winning the Prix Premiere at FiD Marseille in 2014. He received the Arts Council of Ireland’s Film Bursary in 2015.